If you own a swimming pool, ask yourself this question: How many days would you have played in your swimming pool last year if it was just a tad bit warmer? A swimming pool is great when the weather is warm, but many weeks out of the year it is simply unused due to the temperature. With that thought in mind, let’s discuss why you should get a solar swimming pool heater from Solaron of Rocklin! Solar swimming pool heating runs very easily, with no furnaces and electricity is only needed to run the swimming pool pump and any automated controllers. So powering the system is extremely inexpensive. According to the Department of Energy, installation costs approximately the same as purchasing other types of swimming pool heating. Afterwards, solar swimming pool heaters tend to last longer than natural gas or electricity heating systems. So in the end, solar swimming pool heating makes the best money sense. When spring comes, suddenly it’s 80 degrees out. But the nights are still chilly and the swimming pool is just a little too chilly. At that point, you find yourself wishing you had solar heating! That’s why it’s time to begin thinking about heating your swimming pool! Solar not only keeps your swimming pool warmer during the summer, but it also lengthens your swimming season from at least April to October. Olympic requirements state that a competition swimming pool has to be kept at 79 degrees Fahrenheit, with no more variation allowed than one degree up or down. Heliocol is employed at Olympic venues to maintain such an exact temperature with technology that turns the swimming pool pump on and off automatically. If higher heat is needed, the pump runs during the day. If cooling is needed, the pump runs at night. You too can benefit from specific temperature control by asking for a fully automated Heliocol solar swimming pool heating system. When you choose to get a Heliocol solar swimming pool heater, you want the best installer you can find. 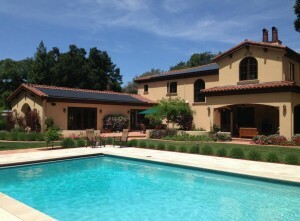 Solaron has the most experience in Rocklin, since we are the #1 installer for Heliocol in all of California. When you think about the large number of household pools throughout the state, and the size of its cities, that really means something! Install your solar swimming pool heater with confidence by going with Solaron! Contact us today at 916-631-9293 or online by using our website.